A small number of nonrandomized and retrospective studies have compared outcomes of classical Norwood procedures for hypoplasticleft-heart syndrome and single ventricle lesions involving a Blalock-Taussig (BT) shunt to the modified procedure using a right ventricle to pulmonary artery conduit. Some of these studies reported data for the same outcomes and a meta-analysis was done to analyze pooled outcomes comparing in-hospital mortality, interstage mortality, cardiopulmonary bypass time, systolic and diastolic blood pressures 24 h postoperatively, length of intensive care and hospital stay, and need for postoperative extracorporeal membrane oxygenation. Right ventricle to pulmonary artery conduit was associated with an insignificant reduction of in-hospital mortality (odds ratio, 0.674, 95% confidence interval, 0.367 to 1.238), and in the length of hospital stay. There were significant reductions in cardiopulmonary bypass time, length of intensive care unit stay, and need for postoperative extracorporeal membrane oxygenation, postoperative ventilation times, and interstage mortality (odds ratio, 0.191, confidence interval, 0.0620 to 0.587). There was a significant increase in diastolic blood pressure and an insignificant increase in systolic blood pressure 24 h postoperatively. This pooled analysis demonstrates potential advantages associated with the right ventricle to pulmonary artery conduit when compared to the modified BT shunt in palliation and demonstrates the need for large randomized controlled trials that compare a number of outcomes in both procedures. Hypoplastic left-heart syndrome (HLHS) accounts for 1% of all congenital heart disease and is the cardiac lesion most commonly associated with mortality in the first month of life. Current treatment options for HLHS include heart transplant or surgical palliation. Surgical palliation may be in the form of a hybrid procedure, involving bilateral pulmonary artery banding and ductus arteriosus stenting, or three-stage palliation. In stage I palliation, the Norwood procedure, consists of creating a neoaorta using the pulmonary artery. This leaves the need for a source of pulmonary blood flow, which, in the classic Norwood procedure, was obtained by a modified Blalock-Taussig (BT) shunt. An alternative variation of the Norwood procedure replaces the modified BT-shunt with a right ventricle to pulmonary artery (RV-PA) conduit. Nonrandomized and retrospective studies have shown potential benefit in outcomes associated with the RV-PA conduit when compared to the modified BT-shunt and this meta-analysis pools data from studies comparing short-term outcomes such as in-hospital mortality, cardiopulmonary bypass time, systolic blood pressure and diastolic blood pressure 24 h postoperatively, interstage mortality, postoperative ventilation time, need for postoperative extracorporeal membrane oxygenation, length of hospital stay, length of intensive care unit stay, and delay in chest closure. The Norwood procedure is also used in palliation of lesions other than HLHS that feature aortic atresia. A small number of patients included in this study fall into this category with other single ventricle lesions. Systematic review of medical literature was conducted to gather studies that compared short-term outcomes after stage I palliation of HLHS or single ventricle lesions with RV-PA conduit compared to modified BT-shunt. Studies were collected using MEDLINE and the Cochrane Library, using web-based search engines such as OVID. Search terms used were stage 1 palliation, hypoplastleft-heart syndrome, Norwood, Sano, right ventricle to pulmonary artery conduit, modified BT shunt, and various combinations of these terms. Hand search for abstracts, articles, and reviews were also conducted using references of all previously identified studies. Titles and abstracts were then evaluated using explicit inclusion and exclusion criteria. Evaluation included assessment of the study type, patient selection, and endpoints reported. [Figure 1] outlines study selection. A total of ten end points were extracted from eight studies, ,,,,,,, with data for all end points not necessarily being extracted from each included study. End points studied were in-hospital mortality, cardiopulmonary bypass time, systolic blood pressure 24 h postoperatively, diastolic blood pressure 24 h postoperatively, ventilation time, need for postoperative extracorporeal membrane oxygenation, delayed chest closure, length of hospital stay, length of intensive care unit stay, and interstage mortality. After articles were collected, evaluated, and found to fulfill inclusion criteria, full articles were obtained. Data was then extracted while further evaluation of study methodology was conducted to ensure included study quality. Individual patient data was not available for included studies, or was limited, so a meta-analysis was done using summary statistics from each study. The MedCalc software package (Version 11.3, Mariakerke, Belgium) was used to perform statistical analysis. Heterogeneity of studies for each end point was evaluated via calculation of the Cochrane's Q statistic. A two-sided alpha error less than 0.05 was considered statistically significant. Heterogeneity analysis is summarized in [Table 1]. The included studies showed no significant differences in patient characteristics [Table 2]. 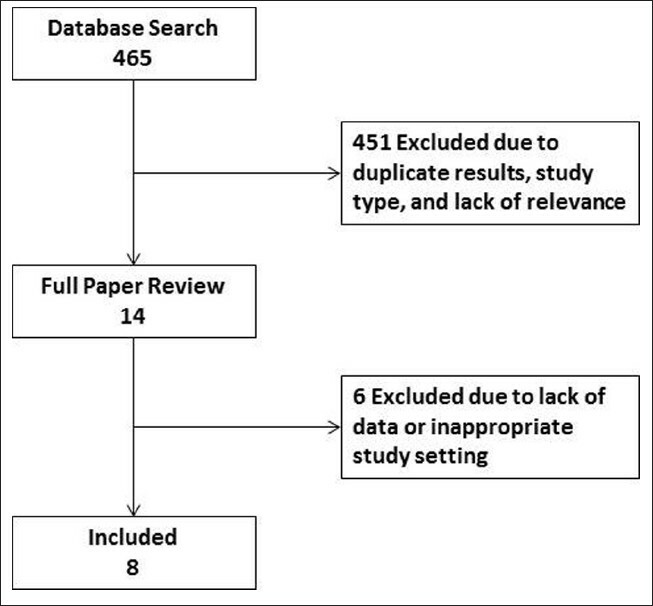 Results of the meta-analysis are shown in [Figure 2], [Figure 3], [Figure 4] and [Figure 5]. There were no significant differences in patient demographics between both groups. 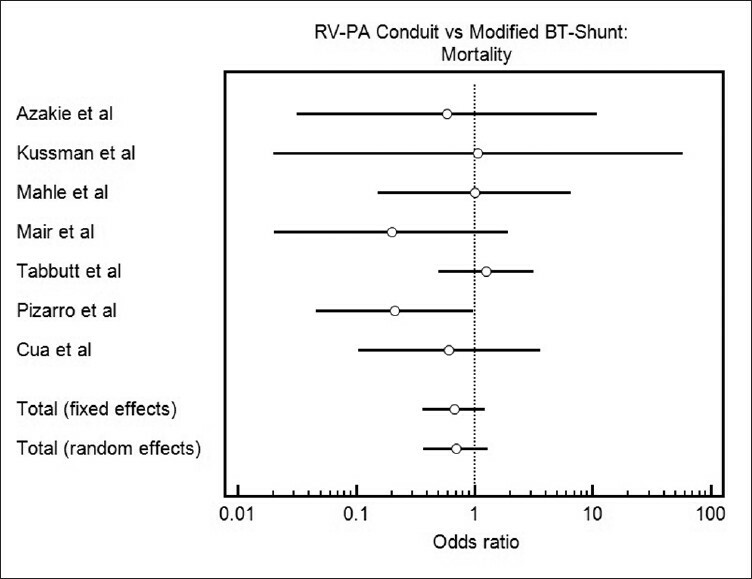 There was a statistically insignificant risk reduction of in-hospital mortality associated with Norwood with RV-PA conduit when compared to Norwood with modified BT-shunt (odds ratio, 0.674, 95% confidence interval, 0.367 to 1.238) [Figure 2]. 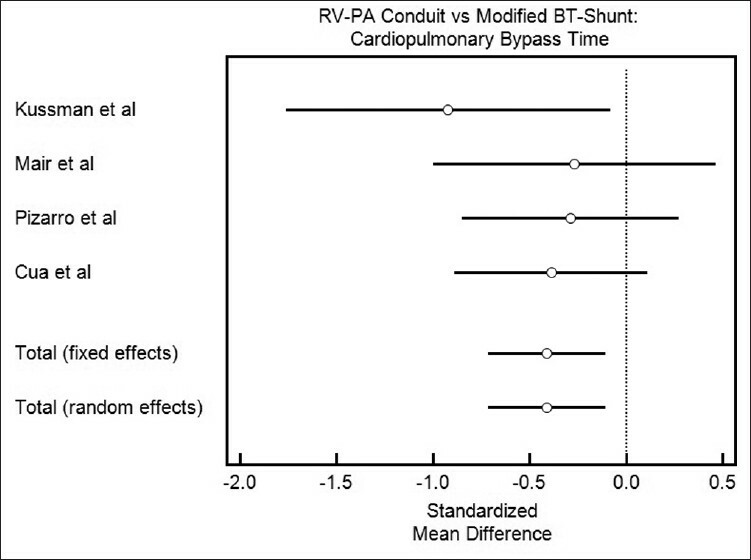 Cardiopulmonary bypass time was significantly lower in Norwood with RV-PA conduit when compared to Norwood with modified BT-shunt (standard mean difference, −0.412, 95% confidence interval, −0.715 to −0.109) [Figure 3]. Postoperative ventilation time was significantly lower in Norwood with RV-PA conduit when compared to Norwood with modified BT-shunt (standard mean difference, −0.452, 95% confidence interval, −0.700 to −0.204). 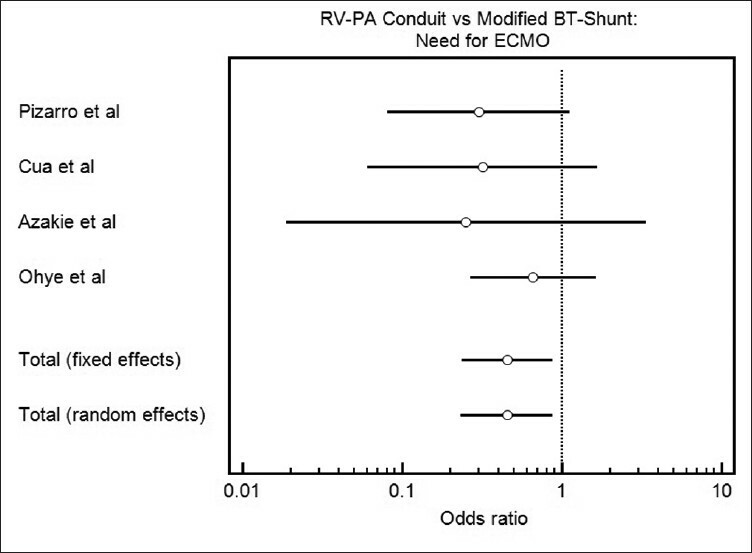 The need for extracorporeal membrane oxygenation was significantly lower in Norwood with RV-PA conduit when compared to Norwood with modified BT-shunt (odds ratio, 0.452, 95% confidence interval, 0.234 to 0.871) [Figure 4]. Delay of chest closure was insignificantly reduced in Norwood with RV-PA conduit when compared to Norwood with modified BT-shunt (0.841, 95% confidence interval, 0.616 to 1.149). Length of hospital stay was insignificantly reduced in Norwood with RV-PA conduit when compared to Norwood with modified BT-shunt (standard mean difference −0.0064, 95% confidence interval, −0.219 to 0.0857). 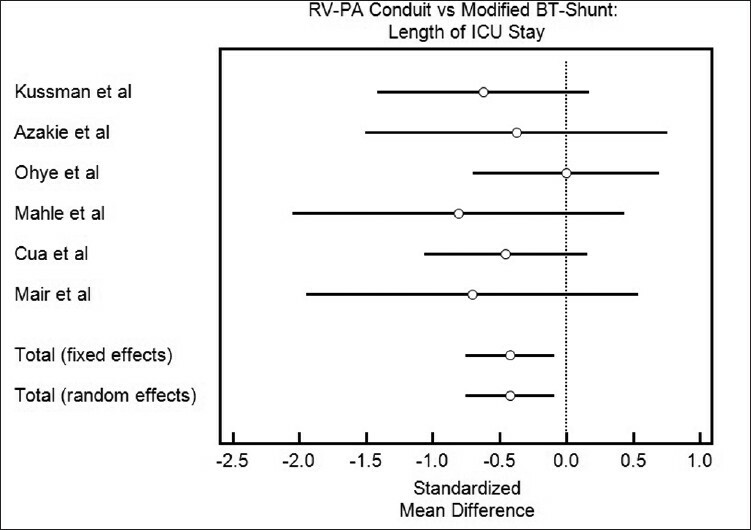 Length of intensive care unit stay was significantly lower in Norwood with RV-PA conduit when compared to Norwood with modified BT-shunt (standard mean difference, −0.423, 95% confidence interval, −0.757 to −0.0900) [Figure 5]. 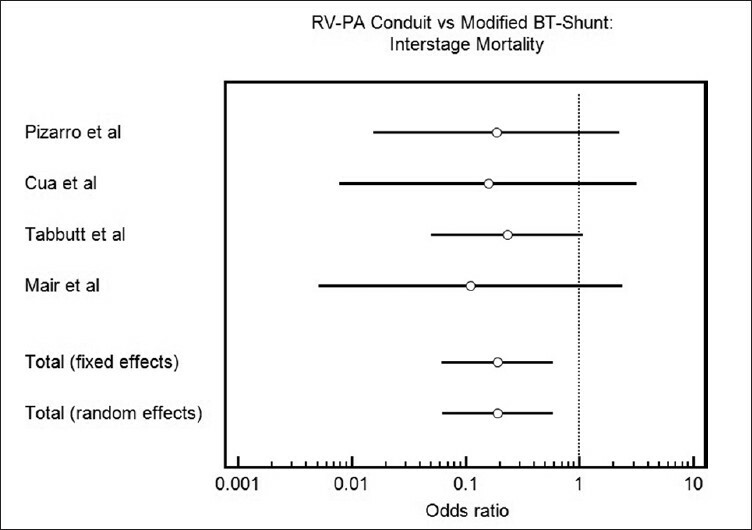 Interstage mortality was significantly lower in Norwood with RV-PA conduit when compared to Norwood with modified BT-shunt (odds ratio, 0.191, confidence interval, 0.0620 to 0.587) [Figure 6]. This meta-analysis pools data from eight studies involving ten endpoints and demonstrates that the Norwood procedure for palliation of HLHS and single ventricle lesions with RV-PA conduit was associated with statistically lower cardiopulmonary bypass time, length of intensive care unit stay, need for postoperative extracorporeal membrane oxygenation, and delay in chest closure, insignificant reductions in in-hospital mortality, length of hospital stay, and delay in chest closure, significant increase in diastolic blood pressure and statistically insignificant increase systolic blood pressure. Our pooled analysis shows similar trends as the individual studies included. In-hospital mortality is of obvious concern and a larger randomized controlled trial may be able to more accurately delineate a potential difference between the two groups. This difference in mortality could potentially be due to decrease in cardiopulmonary bypass times, although in this pooled analysis the decrease was of small magnitude. The insignificantly higher rate of in-hospital mortality in those undergoing Norwood with modified BT-shunt may also be in part to coronary steal, although it is difficult to determine the specific factors with current data. Larger, randomized studies will offer more accurate evaluation of the magnitudes of difference in these comparisons. Inclusion of nonrandomized and retrospective studies, as well as potential selection and publication bias, limit this particular analysis. This pooled analysis demonstrates potential advantages associated with the right ventricle to pulmonary artery conduit when compared to the modified BT shunt in palliation of HLHS and other single ventricle lesions demonstrates the need for large randomized controlled trials that compare a number of outcomes in both procedures. 1. Park M. The pediatric cardiology handbook. 5 th edition. Philadelphia: Mosby; 2007. p. 338. 2. Tabbutt S, Dominguez TE, Ravishankar C, Marino BS, Gruber PJ, Wernovsky G, et al. Outcomes after the stage I reconstruction comparing the right ventricular to pulmonary artery conduit with the modified blalock taussig shunt. Ann Thorac Surg 2005;80:1582-91. 3. Azakie A, Martinez D, Sapru A, Fineman J, Teitel D, Karl TR. Impact of right ventricle to pulmonary artery conduit on outcome of the modified Norwood procedure. Ann Thorac Surg 2004;77:1727-33. 4. Cua CL, Thiagarajan RR, Gauvreau K, Lai L, Costello JM, Wessel DL, et al. Early postoperative outcomes in a series of infants with hypoplastic left heart syndrome undergoing stage I palliation operation with either modified blalock-taussig shunt or right ventricle to pulmonary artery conduit. Pediatr Crit Care Med 2006;7:238-44. 5. Kussman B, Gauvreau K, DiNardo J, Newburger JW, Mackie AS, Booth KL, et al. Cerebral perfusion and oxygenation after the Norwood procedure: Comparison of right ventricle-pulmonary artery conduit with modified blalock taussig shunt. J Thorac Cardiovasc Surg 2007;133:648-55. 6. Pizarro C, Malec E, Maher KO, Januszewska K, Gidding SS, Murdison KA, et al. Right ventricle to pulmonary artery conduit improves outcome after stage I Norwood for hypoplastic left heart syndrome. Circulation 2003;108(Suppl 1):II155-60. 7. Mair R, Tulzer G, Sames E, Gitter R, Lechner E, Steiner J, et al. Right ventricular to pulmonary artery conduit instead of modified Blalock-Taussig shunt improves postoperative hemodynamics in newborns after the Norwood operation. J Thorac Cardiovasc Surg 2003;126:1378-84. 8. Mahle WT, Cuadrado AR, Tam VK. Early experience with a modified Norwood procedure using right ventricle to pulmonary artery conduit. Ann Thorac Surg 2003;76:1084-9. 9. Ohye R, Sleeper L, Mahony L, Newburger JW, Pearson GD, Lu M, et al. Comparison of shunt types in the norwood procedure for single ventricle lesions. N Engl J Med 2010;362:1980-92. Rocha-e-Silva, R., de Mola, R., Santos, E.S., Martins, D.M.S., Pesciotto, V.R., Hatori, D.M., Martins Greco, J.P.